We know daily exfoliation is an important part of a healthy skin regimen, but what about exfoliating in the summer time when it’s hot and humid? There are several different types of exfoliants that can be used on the face, including microdermabrasion, abrasive exfoliating washes, chemical peel exfoliation, laser exfoliation, and topical cream exfoliation. Which one works best during the sunny days of summer? Dermatologists and skin specialists generally advise against any deep skin treatments if there is a risk of excessive sun exposure. You really have to be aware of both direct and indirect sunlight and always wear an appropriate level of sun protection and sunscreen. Although widely available in beauty shops, abrasive exfoliating washes and high concentration cream exfoliants often dry-out the skin and lead to more skin irritation and sensitivity. The best option for daily exfoliation is a light at-home chemical peel that can whisk away skin impurities, open up clogged pores, and improve skin complexion. If your skin is acne prone, Melapads DailyExfoliating Pads are an excellent option for at-home daily exfoliation, even in the summer months. Melapads contain both alpha and beta hydroxy acids and Kojic acid to help lightly exfoliate skin and lighten dark discoloration. Combined with an appropriate sunscreen, Melapads can be used to improve skin quality and brighten skin. 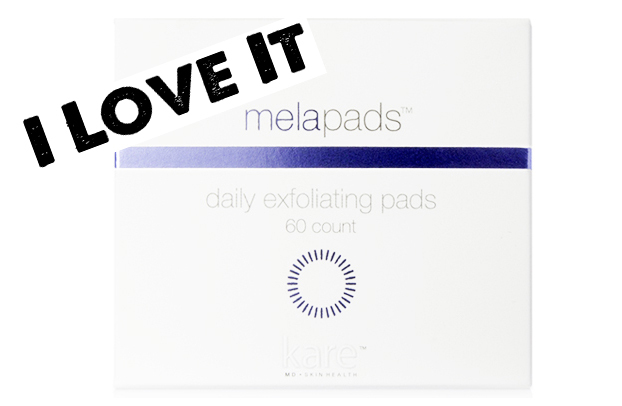 There are sixty pre-soaked pads in each jar of Melapads, enough for twice daily application for one month. The results of treatment with Melapads is quite spectacular, with improvements in skin quality, sebum content, and acne breakouts. As a multi-purpose beauty product, Melapads can help reduce sunspots during the summer, while helping you unclog pores that can cause acne in the future. Verdict: A well thought-out multi-purpose beauty product that can help exfoliate the skin using a powerful combination of salicylic acid, glycolic acid, and kojic acid. Strong enough to improve acne prone skin but gentle enough for daily use. Disclaimer: This is a sponsored post by Kare MD Skin Health. It sounds amazing. Thanks for the review! You've an amazing blog. This product does sound amazing. Unfortunately, my skin is so sensetive I can't use any product. These look like an interesting product! Thanks for sharing this product. I will definitely check it out! This sounds really good however is it available worldwide? I usually suffer from annoying acne and still looking for a good product that will work on me. I read some of your post about this brand, and I'm a bit intrigued. These pads sound awesome! Thanks for sharing Shaira!!! Sounds like an interesting product. Thx for the review. It sounds Good!! Is love To try it! sounds amazing, thanks for the review! Thid sounds like an awesome product...a light peeling is a good option when sun is this strong. I learn so much with this review I will want to try the product. Thank you for the review. Sounds like a great product. I haven't tried an exfoliating pad yet. I'll give this a try.